Their daughter, Victoria Georgina Beatrice Maude Anne, was born in their apartment in Hampton Court Palace on 7 March 1881, but died three weeks later. A royal presence caused some readjustments in the palace and Princess Frederica was duly offered the use of the Royal Pew in the Chapel Royal but declined it in preference for a pew half-way along the north side. The Princess and the Baron, however, would mostly walk to St Maryâ€™s Church in Hampton, where they occupied a pew in the gallery. After the death of their daughter, the Princess devoted herself to charitable activities. She set about founding a home for poor and delicate married women recovering from childbirth. 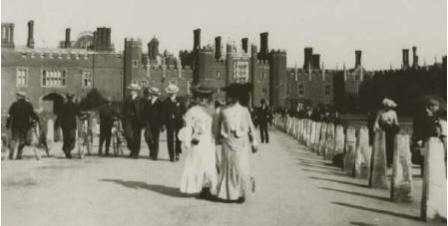 To launch the campaign she organised an event in the Great Hall in August 1881 and with the proceeds from this and other events she was able to open a home in East Molesey for six married women and their babies. Who vendt to hundt in Pushey Bark der rabbits nice and schmall. Und some frendts dey come along mit me for to cut a schine. The paper later published the number of rabbits that the Baron handed over to the poor of Hampton after each of his shooting parties. Apart from her charity work, and, obviously, opening schools, Frederica also had a ship named after her - the London & South Western Railway passenger ship, built in 1890 for the Southampton-Channel Islands / Le Havre route, where it operated until 1911. 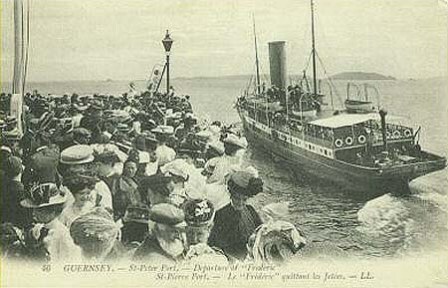 There is a picture of the ship below, leaving St. Peter Port in Guernsey.